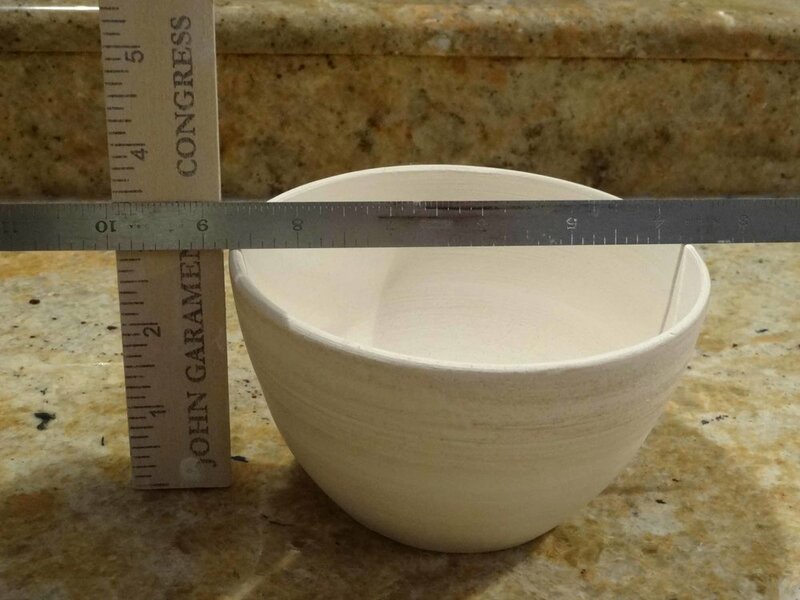 I have read in the forums and watched on YouTube various ways of determining the thickness of the bottoms of pots prior to trimming but have yet to see a simple method that I learned in my first pottery class about 10 years ago. It incorporates the use of 2 straight edges and can be used on pots of any size or shape. In the attached pix you can see how to use a straight edge and a ruler which will tell you in inches (or millimeters) the exact thickness, or you can use a couple of skewers and a marker to give you a visual representation. This way you don't have to tap the bottom while you are trimming to decide if it sounds about right or try to use your fingers to estimate the thickness. It's a real pain for beginners to use these methods and find that they were off just a little as they punched through the bottom of their pot. 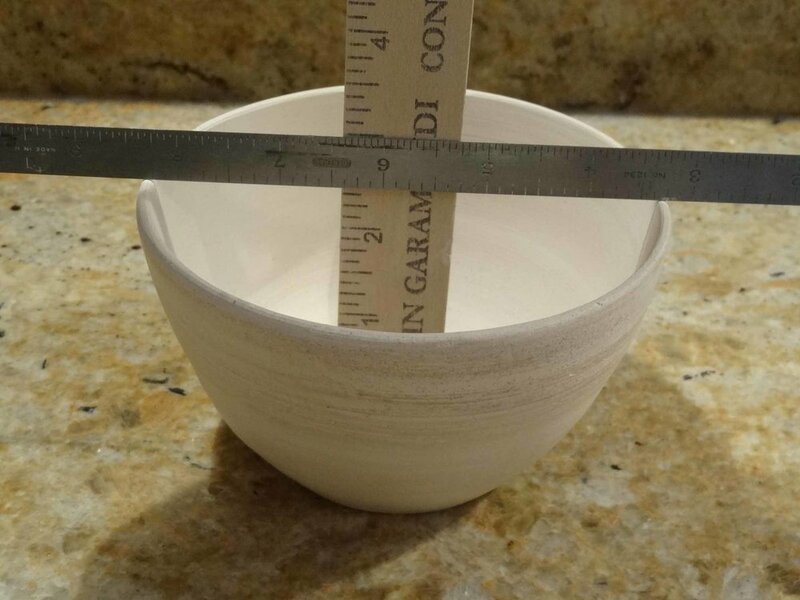 Using this method, you take a measurement from the inside of the pot. Then you take a measurement from the outside and subtract the two and you will know exactly how thick the pot bottom is. Give it a try the next time you trim your pots! 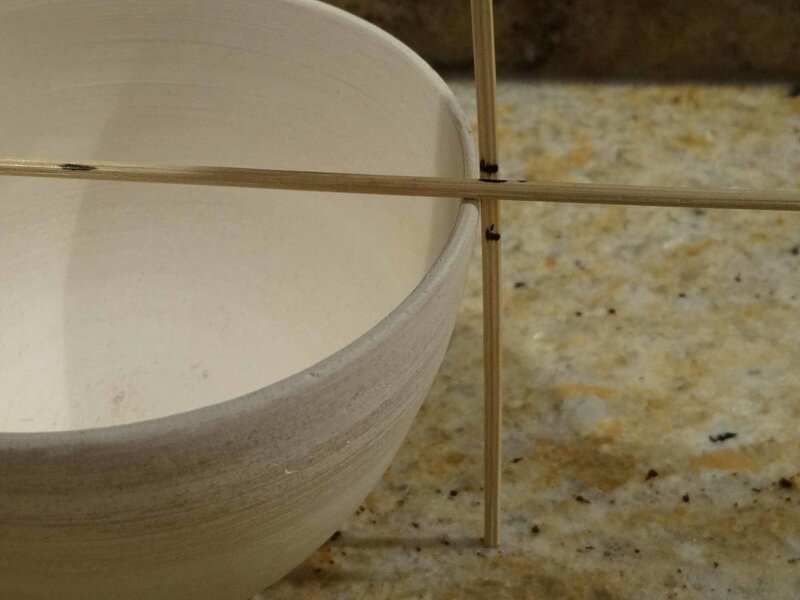 I do this , using 2 hair pins that will stay in place on the chopstick, but can be adjusted for each pots, rather than making marks. Remember to set the pins at the bottom of the chopstick for accuracy. Then I trim out the very center at the desired depth, knowing I can go deeper as the bottom curves up out to the foot ring. Im confused. Why not just use a needle tool? I think the challenge in the question is how to determine the thickness of the leatherhard base before trimming without leaving a destructive hole through the bottom of the vessel (that will later leak, or at a minimum, require effort to repair). 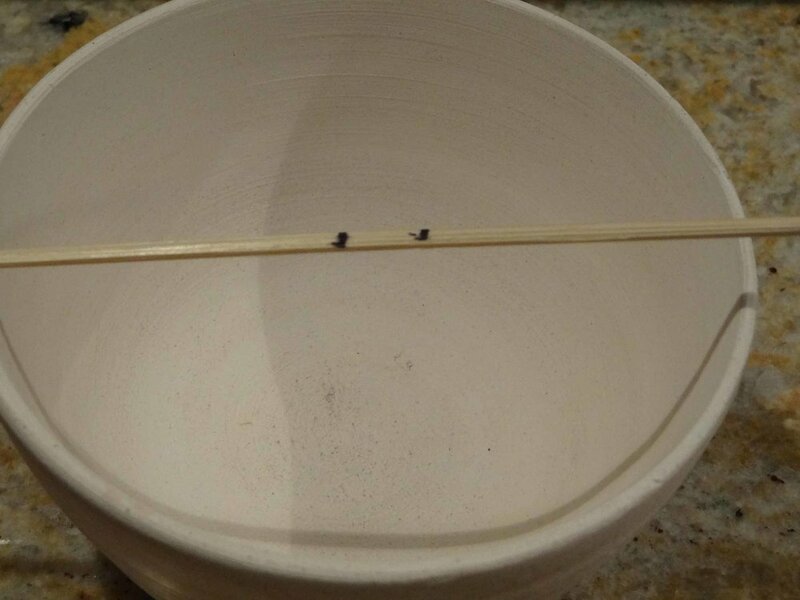 Needle tool holes,have,a,way of reappearing after glaze firing. gosh i wouldnt succeed if i didnt use the needle tool while trimming. i just use a little slip to fill in the hole. and while burning with a rib it closes the hole. i am ever grateful to the needle tool. it really helped me understand how thick my sides were. it taught my fingers to feel. i dont use it so much now. i used johnny's method to figure out the bottom. If you trim a lot eventually you can feel the thickness without any thing but your fingers. I pick up a bowl that needs trimming and feel it then trim it.After doing this for years it only takes once but while you are learning you may have to handle it several times. I have never needed to measure. Get a rough idea by placing a hand inside bottom and a hand outside on the bottom. Flip bowl, center it, and anchor down with little lugs of clay. Start trimming and as you approach your guesstimate for perfect thickness, stop the wheel and lightly push a finger against the trimmed out bottom...see or feel movement? Your done. If no movement, trim a little more and repeat light push til it moves. potter's note: this works on normal leatherhard pots. if pot is too hard the bottom will not move, and you should likely just throw another pot anyway. if pot is too soft it will move to soon but likely if it is too soft you will have warped the rim while trimming and have to come up with a creative answer on what to do with your ruined rim so the slightly to thick bottom is the least of your worries. 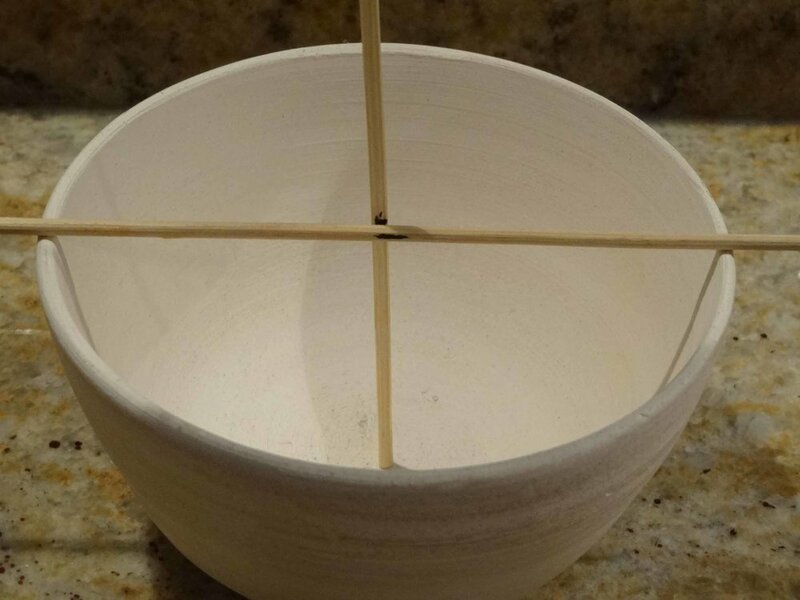 I feel its better to lean how to do this with ones hands by learning how to feel the pot and it thickness. Its a skill set and potters need to learn it. 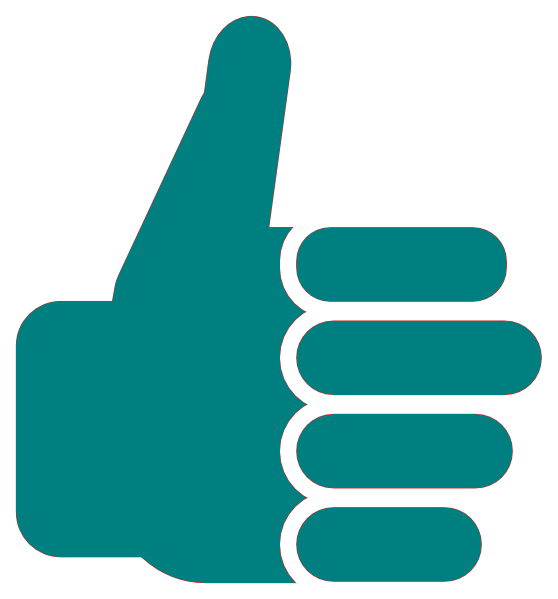 Going to a craft fair or pottery shop and lifting/feeling the wares can be instructive, too. Sometimes it's easier to call "bottom heavy" on someone else's ware. And you will definitely know it when you lift a well-balanced piece. As MarkC said, you'll need to cultivate the skill of feeling what's wrong and what's right (and where) in order to be an accomplished potter.